This is like something that others have done often. Maybe I have even used something similar at times in the past, but today a group of students had a big a-ha moment. We have reviewed the basic polynomial operations and like robots they can do it well for the most part. f(x)=x+2 and g(x)=2x-1 on the board. I pointed out specific points, asking for their sum and recorded on the board. This graph only shows part of our discussion. 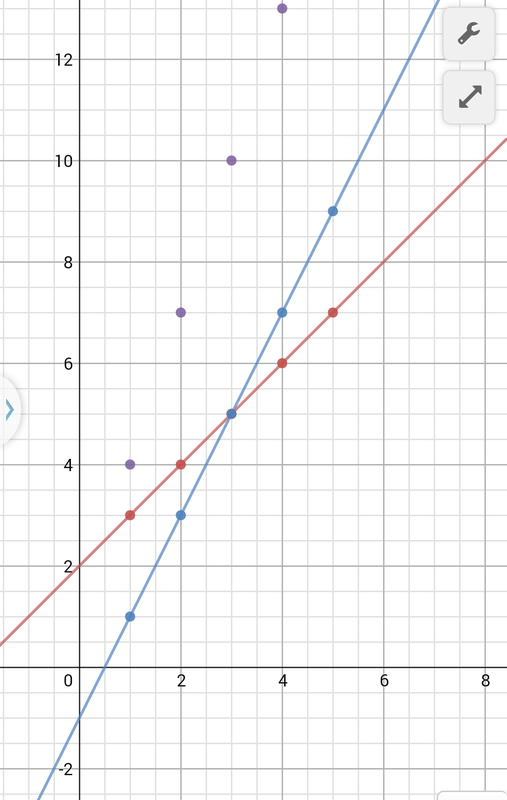 Next, I graphed a purple function f(x)+g(x). “Holy shoot” was exactly what a student said. Yep, they edited the version just for me. But there were several ah’s and oh’s. Thanks to Desmos…they could see the math they’d been doing on paper. We combined f(x)+g(x) on paper to get 3x+1. I graphed it and they were amazed it hit our points. I know this isn’t so amazing for many, but the look on my students faces today…they got it.